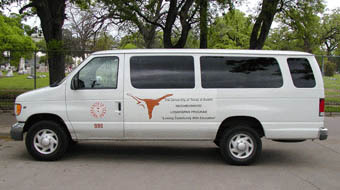 As specified in The University of Texas System System-Wide Policy Number UTS157, 12 and 15-passenger vans that are owned, leased, or rented for university business will be operated only by trained, authorized drivers who understand and are familiar with the handling characteristics of the vans, especially when the van is fully loaded. To be authorized by the university to drive 12 and 15-passenger vans, operators must attend van-specific training, including behind the wheel, on the road, training. They must also have completed the UT "I Drive Safely" course and must have a clean driving record. Contact one of the authorized trainers to make arrangements for training. Keep in mind, these people have regular jobs and will require advance notice to set up a training session.